Yes, messy pets and clean carpets can coexist. 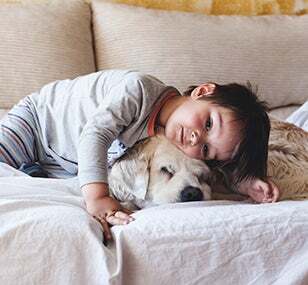 Clorox® Pet Solutions Carpet Cleaner lifts and neutralizes tough pet stains and odors, so you can keep carpets looking clean and smelling great. Generously directly to pet stain. Foam to absorb into stain for 3 minutes. Or blot area with an absorbent, dry cloth. To dry completely and then vacuum. Want to find other ways to use Clorox® Pet Solutions Carpet Cleaner? Where can I buy Clorox® Pet Solutions Carpet Cleaner? You can find select Petco stores near you that sell Clorox® Pet Solutions Carpet Cleaner on our Buy Now page . It's a good idea to call the store before going, to make sure they have it in stock. If you have any trouble finding it at a nearby store, you can also buy it online. Where can I get coupons for Clorox® Pet Solutions Carpet Cleaner? Check the Coupons page to see if there are coupons available for Clorox® Pet Solutions Carpet Cleaner. And sign up for the Clorox newsletter to find out about new coupons via e-mail. Where can Clorox® Pet Solutions Carpet Cleaner be used? Clorox® Pet Solutions Carpet Cleaner is safe for use on carpets made of nylon and other synthetics and on stain-resistant carpets. Before cleaning, always test for colorfastness on a hidden section of carpet. Does Clorox® Pet Solutions Carpet Cleaner contain bleach? No. Clorox® Pet Solutions Carpet Cleaner is made with a bleach-free ingredient formula.